Prepare the dough to make sugar skulls combining the corn syrup, vanilla and egg whites in a small bowl until well blended. Add 2 cups of the powdered sugar and stir until mixed. Keep mixing and adding sugar until a stiff dough forms into a ball. Use your hands to mix in more sugar and keep mixing until the dough is no longer shiny and doesn't feel moist to the touch. Dust a clean, dry work surface (such as a counter or pastry board) lightly with powdered sugar and coat your hands with it. Kneed the dough, adding more powdered sugar until the dough feels very dry. Test the dough by forming it into a ball, if the ball falls quickly add more powdered sugar and continue to kneed. Put 1 cup of cornstarch in a plastic bag. Pull off 1 heaping tbsp. of dough at a time and form each into a ball. Place the ball in the bag of cornstarch and shake it up, then put the ball in a plastic container. Once all the balls have been coated in cornstarch cover the container with plastic wrap and refrigerate overnight. Next day take the balls out of the refrigerator and gently warm them in your hands for a few moments. Form into skulls, poking holes for eyes nose and mouth with a toothpick or the end of a small paint brush. 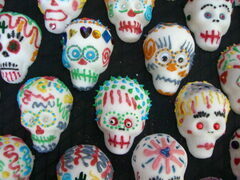 Set the sugar skulls in a cool, dry place to harden overnight. 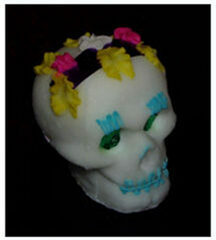 Decorate your sugar skulls the following day. You might paint them with a small, soft paintbrush dipped into food coloring. You can also decorate them with sugar frosting (the kind that hardens) using a pastry bag or frosting tip.